I was fortunate enough to get into the Necromancer Beta (which is now over). I focused my time on Adventure Mode, so I could save the fun of discovering the in-game Necromancer lore for later. By the time the beta ended, my Necromancer was at Level 52. This means I did not get the opportunity to try out the new armor sets. Even so, I found the Necromancer to be really fun to play. 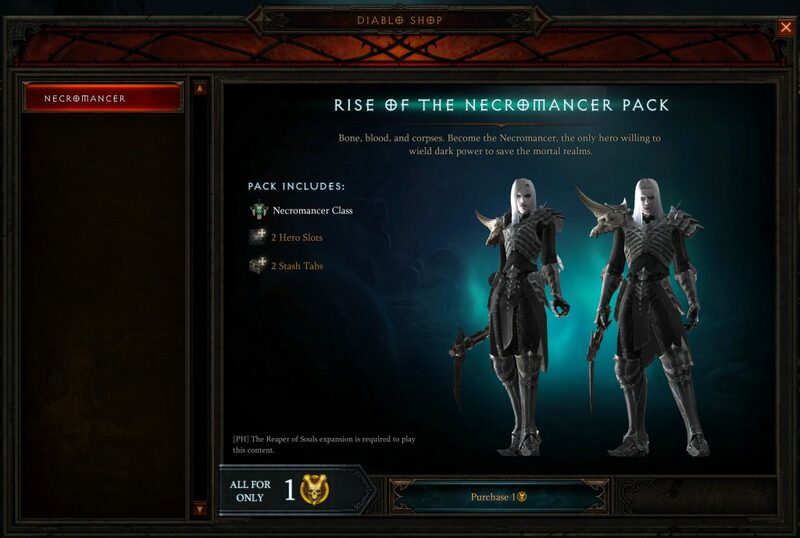 Keep in mind the these screenshots are from a beta – so things may change between when the beta ended and when players can buy the Necromancer Pack. I’ve included some screenshots that are unique to the beta and definitely won’t make it into the “live” Diablo III game. 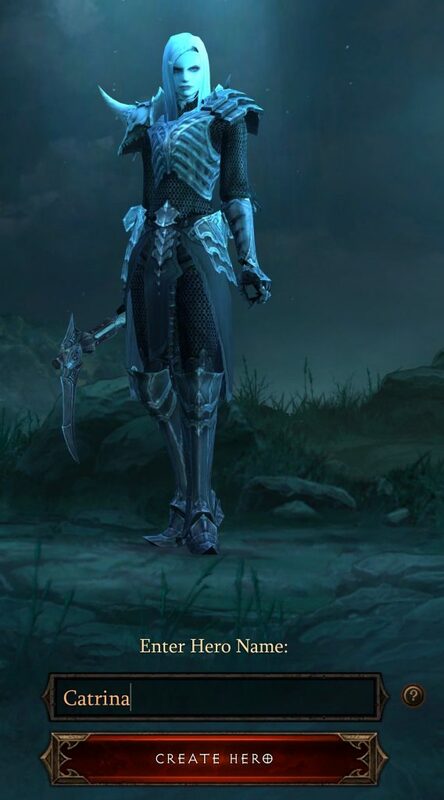 Players who got into the Necromancer beta could choose to play either a female Necromancer or a male Necromancer. I chose the female one. I’ll likely end up with two Necromancers, one of each, eventually. But, for the beta, I just picked one. The bottom of the screen said “In order to play as the Necromancer you must buy it.” This confused me. At the time, I thought it meant I would have to spend real-world money to play in the beta – which seemed really strange since Blizzard has never required that before. When I clicked the button marked “purchase”, some weird glitch happened. I returned another night and gave this one more try. This time, it worked. I was sent to a screen that allowed me to “purchase” the Necromancer Pack for one …. funny looking currency that I had someone already obtained. Blizzard was not requiring players in the beta to spend money on the beta. 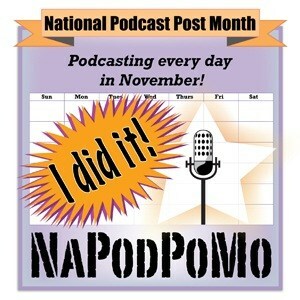 That was good news! This gorgeous screen appeared after I clicked the button to “purchase” the Necromancer beta. To me, the art looks like the Book of Tyrael. 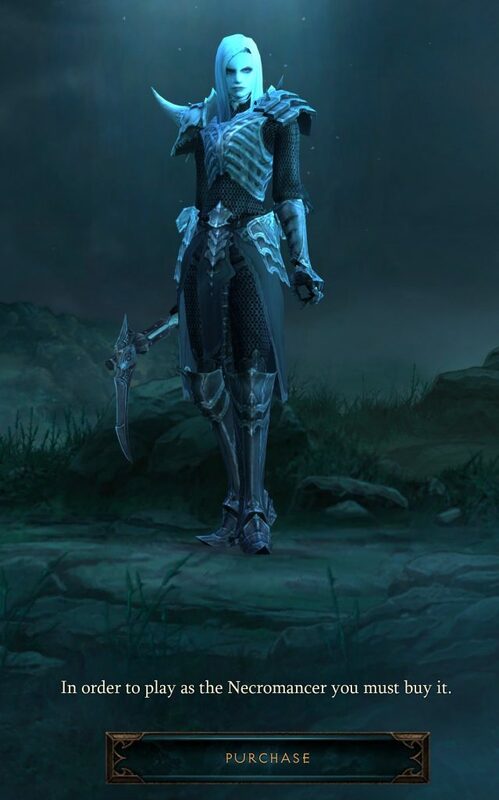 There is potential that this is a placeholder and entirely different artwork will appear when players purchase the Necromancer Pack. 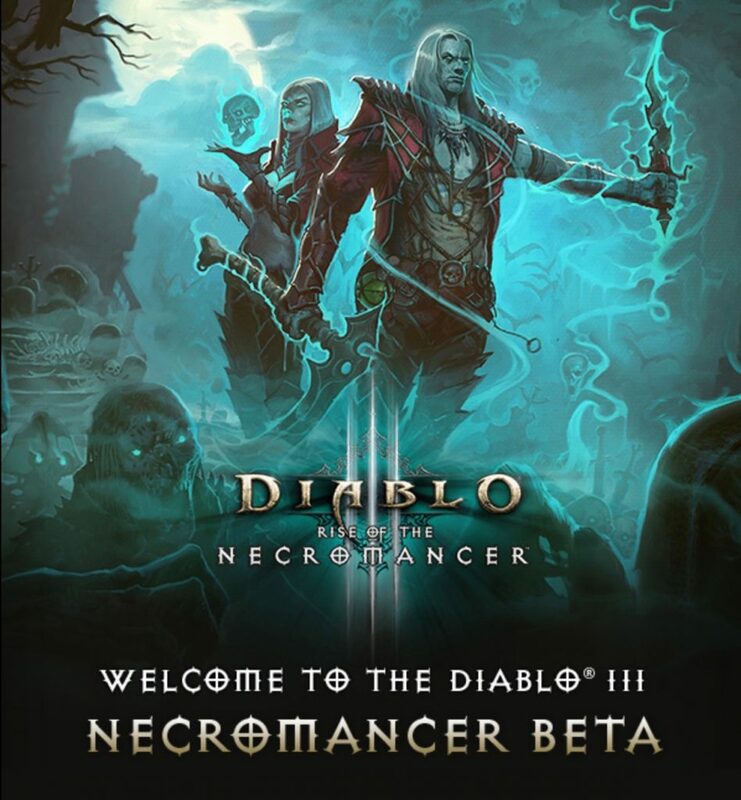 To be clear: players who got into the Necromancer beta did not get the Necromancer Pack for free. We had to go through this little procedure of “buying” it in order to use the Necromancer in the beta. There were times in the beta when the Necromancer was not available to play. 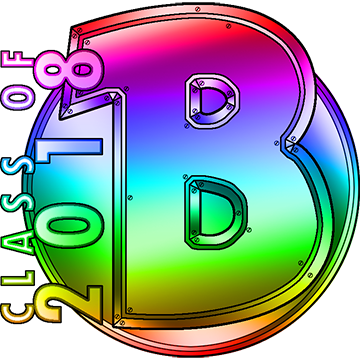 Once the beta ended, our access to that class disappeared. We will all have to go buy the Necromancer Pack. I named my Necromancer Catrina – because the Necromancer class made me think of El Dia de los Muertos and La Catrina. If you have ever been to a “Day of the Dead” fest, you probably saw a woman wearing a fancy dress and hat with her face made up like a skeleton. She was representing La Catrina. It was a good enough name for a beta character that was going to raise skeletons. Here is Catrina the Necromancer at Level 1. The banner next to her is set up like how I had the banner in the “live” Diablo III game. 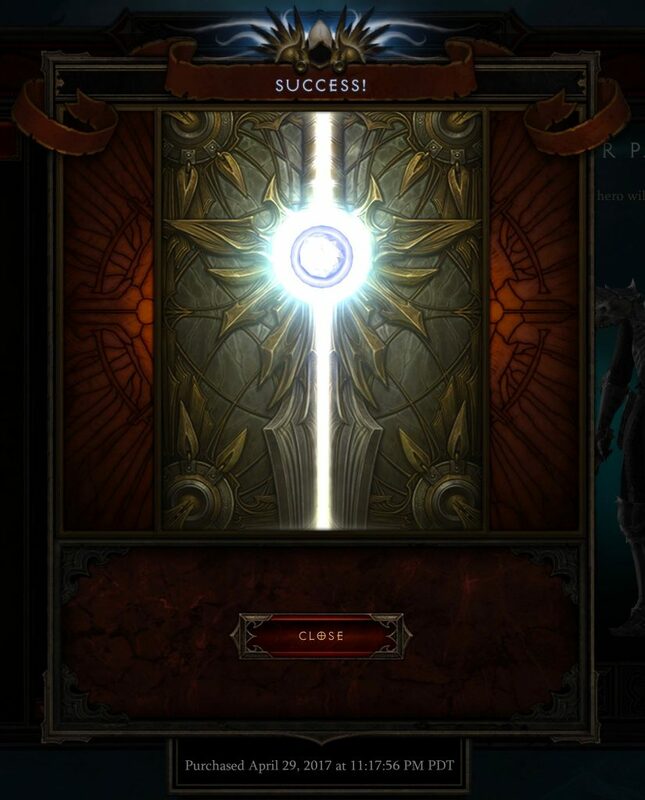 One of the first things that happened when I started the Necromancer beta was the game recognized that I had earned some Feats of Strength Achievements – and popped them all up, one after the other, on the screen. I figure it copied over my banner, too. 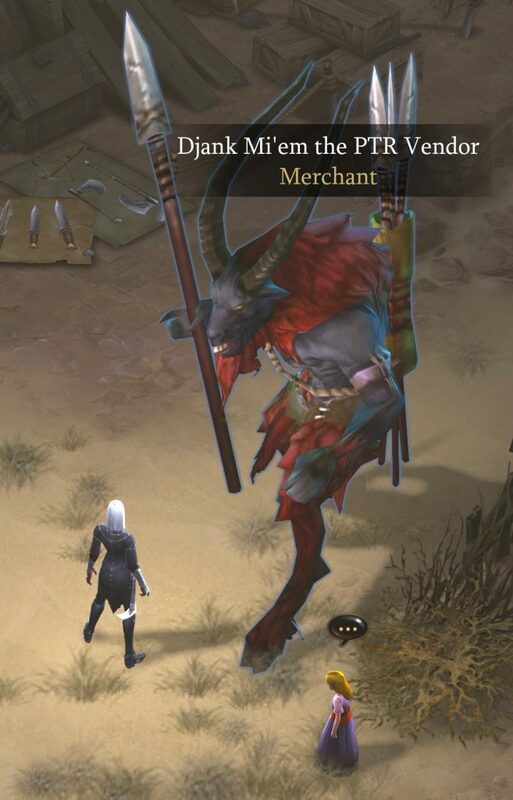 You won’t see Djank Mi’em the PTR Vendor merchant in the “live” Diablo III game. To me, he looks like a gigantic Khazra. His entire purpose was to give players in the beta an easy way to obtain the Necromancer class sets. The PTR Vendor sold four items, each of which cost 500 Blood Shards. 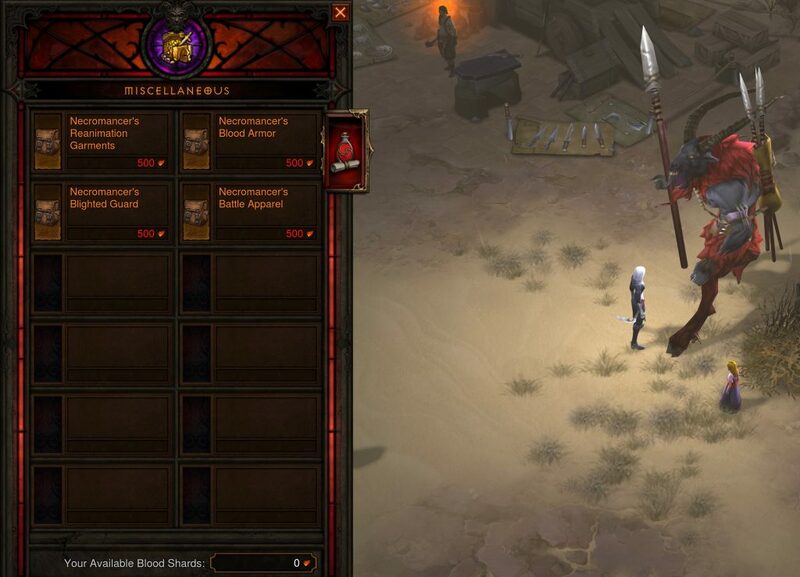 Those items were satchels that held a Necromancer class set: Necromancer’s Reanimation Garments; Necromancer’s Blood Armor; Necromancer’s Blighted Guard; and Necromancer’s Battle Apparel. I had just started the Necromancer beta, and had zero Blood Shards. So, I started running Nephalem Rifts in an effort to obtain at least one of the sets. 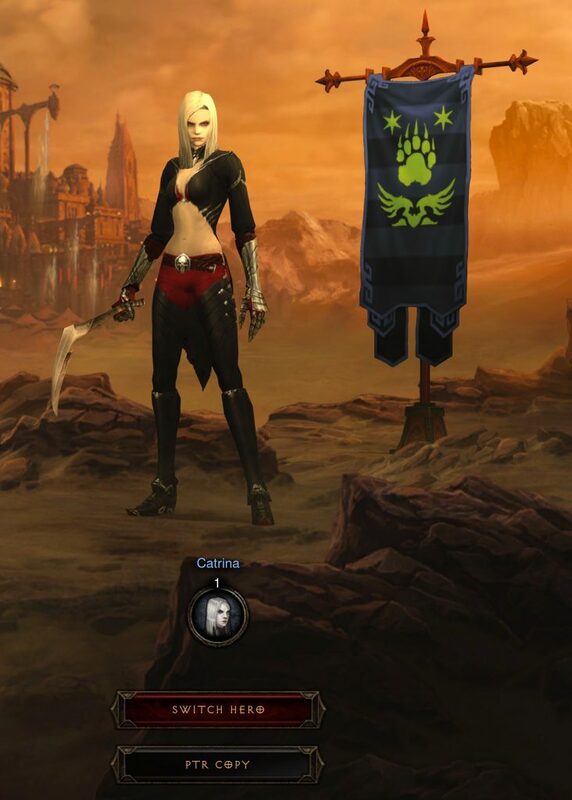 My goal was to try and get Catrina the Necromancer to Level 70 so I could use a set – but that didn’t end up happening. My experience in the Necromancer beta will continue through a series of upcoming blogs. Most of the screenshots I took turned out to be garbage. There were also plenty of good ones. 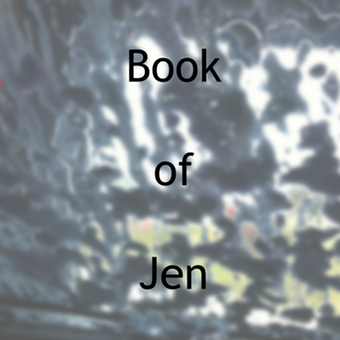 There are too many to stuff into one blog post, so I’m going to break it up into several posts.